Here on breath-taking Hawaii we have the immense blessing of swimming with the dolphins who play, rest and birth in the bays close by. At any time in life, and especially during pregnancy and labor, swimming with the dolphins is one of the most healing and profound experiences of a lifetime. Being in the ocean with the dolphins brings a deep, heart-centering peace and bliss. Each person has a unique healing and message to receive from the dolphins. Their pure playfulness and beauty inspires and sparks the spirit! Your unborn baby also experiences these positive feelings which offer many healthy benefits through out his or her birth and life. Dolphin-Assisted Birth: In a dolphin-assisted birth pregnant mothers experience an abundance of joyous and peaceful prenatal and early labor contact with the wild Hawaiian Spinner dolphins. The dolphins’ sonar heals and balances mama’s and baby’s cells, DNA, spirit and soul! These benefits coupled with the enjoyable exercise during swims and the relaxing buoyancy of the healing ocean creates a unique and amazing experience. We intentionally bring the dolphins' energy and joy into the birth room embracing the birthing mother with strength, joy and relaxation. The mother's strength of spirit and body achieved with the support of the dolphins provides power and serenity in the birth process. Usually the birthing mother desires to give birth in a big tub of warm water in her cozy home. Dolphins have been known to be attracted to pregnant women and may detect that a woman is pregnant by using echolocation. 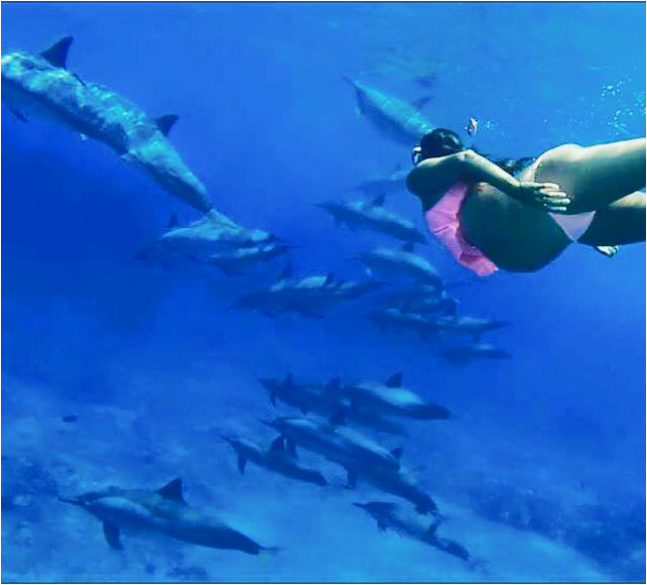 I offer Sacred Dolphin Swims and Dolphin Assisted Births to those interested in having this life-changing experience, with a specialty in leading pregnant mothers in this extraordinary meeting and interaction with wild dolphins in the warm, clear, turquoise waters of Hawaii. Come to Hawaii and deeply enrich your pregnancy with amazing experiences with Hawaiian Spinner Dolphins! Come have a gentle birth on this amazing island...stay near the bays where the dolphins play...experience a gentle dolphin-assisted birth, and receive with comprehensive, professional holistic midwifery care.